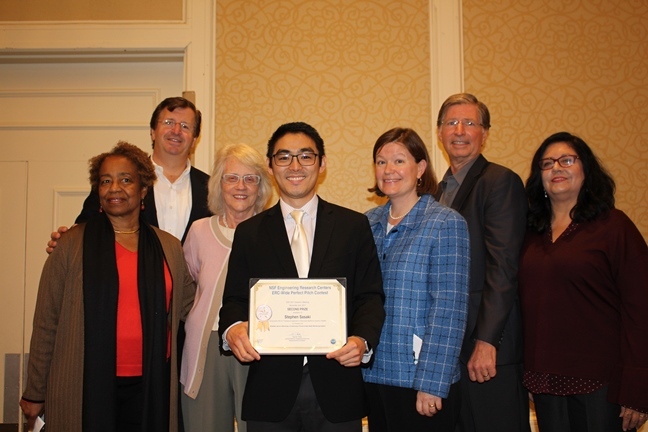 Stephen Sasaki took second prize in the 2017 Perfect Pitch contest with his talk on"Wireless Lab on a Microchip: A Continuous Clinical Grade Health Monitoring Implant." Stephen was born in Fresno, CA and received his B.S. in chemistry at the University of California, Irvine in 2013. Stephen is currently a Ph.D. candidate in chemistry at the University of California, Los Angeles. His research in the Tolbert lab focuses on magnetic nanocrystals and multiferroic systems. In addition to research, Stephen has been an active member in the TANMS-ERC, serving as the TANMS student leadership council president and leading numerous K-12 science education and outreach opportunities. As a researcher with Attention Deficient Disorder (ADD) and as a public speaker overcoming Tourette’s Syndrome, Stephen hopes to continue to be involved with outreach after completing his Ph.D. in order to connect with and motivate young adults who struggle with similar barriers.